Leap and jump just like Spider-man in this web-free playground. 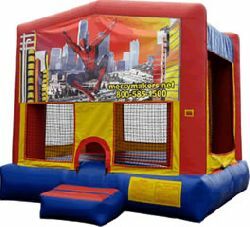 Battle imaginary foes, as the superhero in the Spider-Man bounce house. Note: This licensed theme is also available in a jump/slide combo. Reminder that silly string can damage the inflatable unit and will have a fee charged if used in or on the unit.